Do you know what philosophers these days call 'the hard problem'? Of all the questions philosophers (and scientists, and mystics) have asked themselves throughout the millennia, what might they consider to be the most difficult thing to explain? 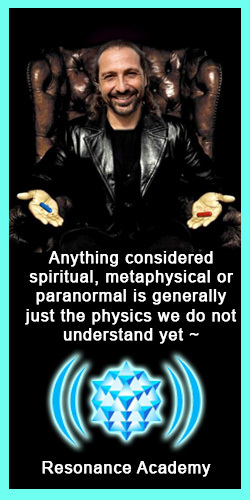 Well... it's the nature of Consciousness... the subjective experiencer and the experience, and how qualitatively different they are from the phenomena and substance of external material reality. 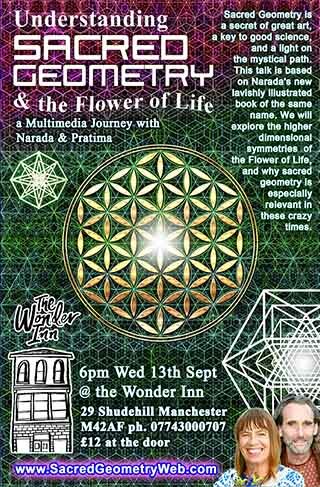 Based in the Byron Bay region of NSW Australia, Narada Dan Vantari & Pratima Michele Mumford-Sephton are popular speakers on subjects such as alternative views of ancient history, cutting edge science, and the transformation of global society. Narada specializes in Sacred Geometry and has written and illustrated a book about the Flower of Life, higher dimensions, and sacred geometries relevance to modern life. You can read the book or order copies at UnderstandingSacredGeometry.com. Pratima has in the past held spiritual gatherings called Satsang. She presents on astrology and analysis of future trends, and has a particular interest in global conspiracies, about which she is writing a book. Narada is a graphic artist and singer-songwriter, as well as a website creator. You can find all his other projects at NaradaDesign.com, including SacredGeometryForum.com, ByronNow.com, BirdTribes.com, an album of his original mystical songs at JewelsAndFlames.com, his 3D printed geometry jewelry and models at 3dMandalas.com, his artworks on full color T-shirts at SacredGeometryTshirts.com, and the Universal Yoga Mandala poster at Yogaverse.com. WE WILL BE OFFERING a few talks in May/June of 2018. 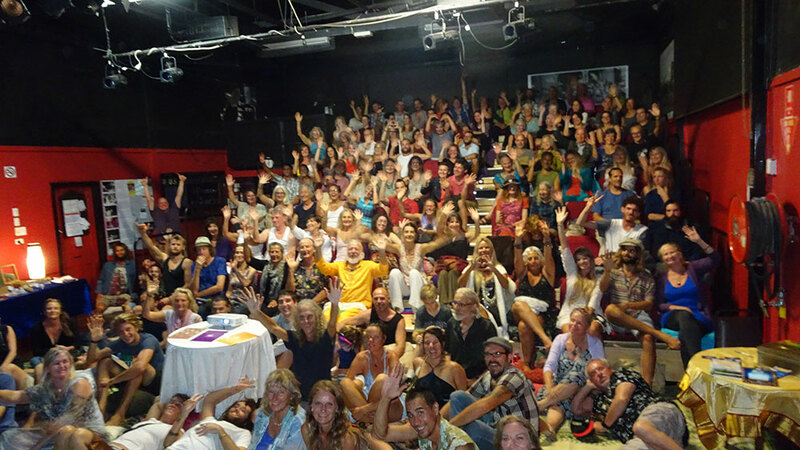 We plan to present at the Renew Fest in Mullumbimby , the Drill Hall Mullumbimby, and the Infinite COnnection on the Gold Coast. Dates and flyers coming soon! THE CONNECTED WORLDVIEW – is our most popular presentation and we will no doubt be offering it again later this year. Humanity is in the midst of a paradigm shift to a connected worldview that is revolutionising physics and cosmology. This shift will ripple out to affect every aspect of society. We have been taught many half truths about the universe, the history of this beautiful planet, and the nature of consciousness itself. Using an awesome collection of slides and video clips we will explore the new pyramids and ancient megalithic sites that have been discovered by recent research and new tools such as infrared laser imaging. We will look at the possibilities of how they were really built and the implications they have for history and archeology. Narada leads us through the history of the current scientific paradigm so we can better understand Nassim’s work and the new discoveries and possibilities that are arising now. He will cover the theories behind Nassim’s Harmonic Flux Resonator device that draws energy from the vacuum, explain the geometrical foundations of Nassim’s physics, and share his appreciation of the beauty of Nassim’s Fracto-Holo-Graphic Universe. We will also look at the crystal skulls and elongated skulls that are being found around the world in astonishing numbers, and look at their implications. Bringing all these insights together can free us from our cultural conditioning about the nature of reality. Not only that – this knowledge can help bring about a world paradigm shift that unites all of humanity as one in a conscious evolutionary process that brings peace and joy to all beings. Free energy from the vacuum is achievable, even control of gravity is possible, an abundant economy is natural ~ once we free ourselves from the scientific materialistic paradigm…that we live in a random, and essentially meaningless universe. The connected worldview is a return to the simple geometric wisdom of the Ancients, a return to working with the patterns of Nature ~ with a few new twists. We participated in the first ever online Unified Physics course, the Delegate Program offered by Nassim Haramein and The Resonance Foundation, that ran from Oct2014 to Feb2015 and had 1,300 participants including us 🙂 [break] There are 6 modules that cover the importance of our societies World View, how it was formed, Modern Physics, Unified Physics, Ancient Origins, and the Implications & Applications of this Knowledge. They are still running the course, which will get a huge burst of publicity when The Connected Universe movie is released later this year. Catch the trailer for it below. We highly recommend joining in for a life changing experience! My name is [break]Pratima Mumford-Sephton. [break][break] All my life I have been deeply interested in exploring the unity of science and spirituality. In the last decades the outward manifestation of this has been in two forms. [break][break]Firstly that in 1993 my guru Sri H.W.L. Poonja ( fondly known as Papaji ) unexpectedly asked me to begin holding Satsangs (spiritual gatherings for ‘Self Enquiry’ in the tradition of Ramana Maharshi ). Click here for a whole page of ‘advaita vedanta’ wisdom. [break] I did this in my spare time while creating the fashion beading industry in my adopted home of Bali Indonesia. 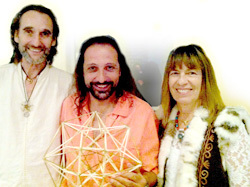 [break][break]And secondly, that in 2011 I journeyed to Mexico to study with ‘mystic physicist’ Nassim Haramein to be able to teach his new World View and the paradigm shattering physics that he has brought through with it. Nassim is a ‘synthesist’ not a reductionist and his presentations usually cover all the subjects included here on this website including society, medicine, history, and more, as he sees all things as being inter-related. [break][break]My hope is that this website will do justice to both these wisdom streams that have flowed through my life bringing such blessings.